A new project is opening today, Friday, June 15, 2018, at the LHC, the large Hadron Collider. Initiated in 2011, this project aims to bring into service by 2026 a high-luminosity LHC (HL-LHC) that will increase the number of proton-proton collisions and collect more data. France contributes significantly to this project (up to € 180 million, including payroll). CNRS and CEA teams are particularly involved in research and technological developments on superconducting magnets as well as in the detectors and accelerator update. On the French side, more than 400 scientists are accompanying the renewal of the world's largest and most powerful particle collider. 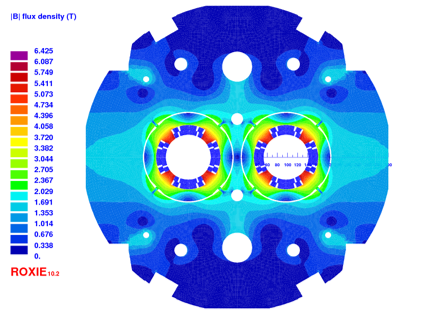 Magnetic design of the 90 mm double-aperture quadrupole with NbTi coils. The diagram shows the distribution of the magnetic field in the different components of the magnet when the nominal current flows through the two openings. 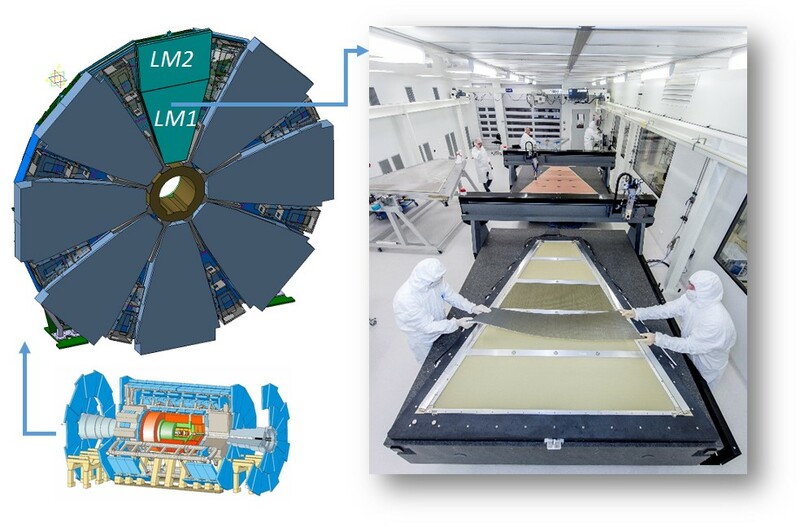 The HL-LHC project aims to improve the discovery potential of the LHC by increasing the number of proton-proton collision per brunch-crossing by a factor of ten from 2026. For example, every year 15 million Higgs bosons will be produced, compared to a total of 1.2 million between 2011 and 2012. Such a large amount of data will make it possible to obtain a much better sensitivity to find rare processes until then inaccessible. CEA and CNRS participate in this project. There are two types of improvements to be implemented: those on the accelerator and those on the detectors. The Laboratory for Superconducting Magnet Research (LEAS) of DACM/IRFU develops with CERN and industrialists one of the new quadrupoles for the insertion area in front of the detectors where the collisions take place. These magnets will be part of a quadrupole set (Q1, Q2, Q3 and Q4) that will focus the beams before collisions. They will help to increase the integrated luminosity of the HL-LHC (ie the total number of collisions), up to ten times the original LHC nominal value. Learn more about the "developments for future superconducting magnets from the LHC" at the DACM. Left: representation of the insertion magnets for HL-LHC (E. Todesco, CERN), right: realization at CEA/Saclay of a winding layer for the quadrupole Q4. ATLAS and CMS sub-detector upgrades aim on the one hand, to make the detectors more radiation-resistant and, on the other hand, to maintain their performance in an environment with a high pile-up rate (at each beam crossing there could be up to 200 collisions compared to about 30 at the moment). IRFU will contribute to various sub-detector upgrades that will take place during the two phases dedicated to detector upgrades. Construction using the MICROMEGAS technology (initiated at Saclay) of 25% (~ 300 m2) of new small wheel forward chambers (NSW). Substancial participation in the integration of these new wheels and the alignment system. IRFU is the only institute to perform all the assembly on site. Design of the analog part of the new electronic board that determines the first level trigger for the electromagnetic calorimeter. A first prototype, passing the tests with data, has already been installed in 2014. The production of 130 cards will start at the end of 2018. Numerous projects are planned from the upgrade of electronic readout boards to detectors, such as the ATLAS inner detector and the CMS electromagnetic calorimeter.